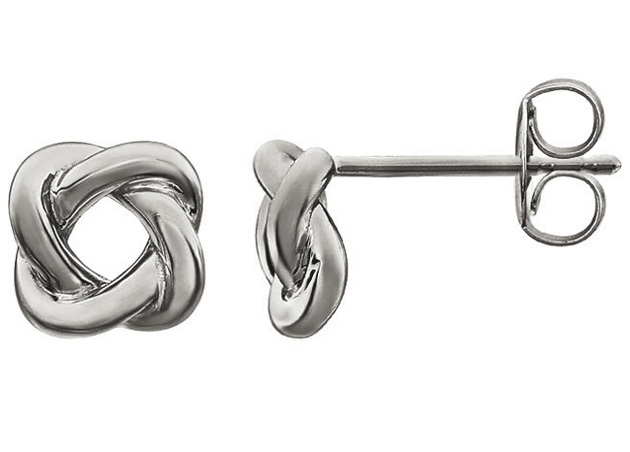 Apples of Gold offers their unique love knot design earrings in a stunning 14K white gold! These white gold earrings have plenty of detail in the open love knot design on each earring. The earrings feature a friction push back closure that makes it easy to be sure your earrings stay in place. Each earring measures 7mm x 7mm, or just over 1/4 of an inch in size. The love knot design of the earring is a fantastic design to choose to let the special lady in your life know how much she means to you. We guarantee our 14K White Gold Love-Knot Design Earrings to be high quality, authentic jewelry, as described above.